For a professional sports team that wins a championship, visiting the White House is commonplace. While many, if not all players from said championship teams go to be honored, some prefer not to go. Martellus Bennett and Devin McCourty are two Patriots players who have already decided they do not want to go to the White House whenever the team goes. 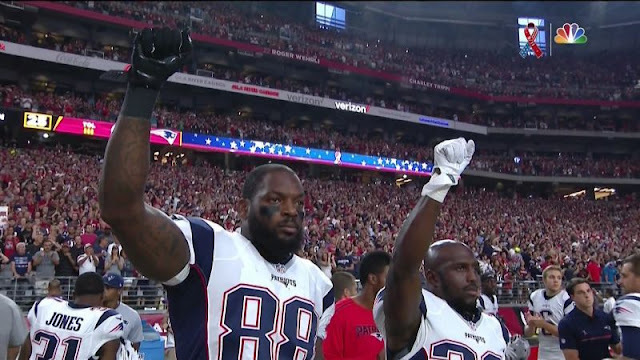 Bennett and McCourty, in so many words, do not support President Donald Trump. “With the president having so many strong opinions and prejudices I believe certain people might feel accepted there while others won't,” McCourty added. It's been well-documented that many in the Patriots organization have a strong friendship with President Trump, so that automatically makes this a big deal. But the organization respects players' beliefs. It's also not the first time a Boston athlete has missed a White House visit. Tom Brady skipped it in 2015, and Tim Thomas of the Bruins skipped it in 2011.